Germplasm is the fundamental unit of plant breeding and is the common element to almost all relationships in the BMS database. Crop databases require that germplasm be uniquely identified. The BMS assigns numeric identifiers, called GIDs, to germplasm units. 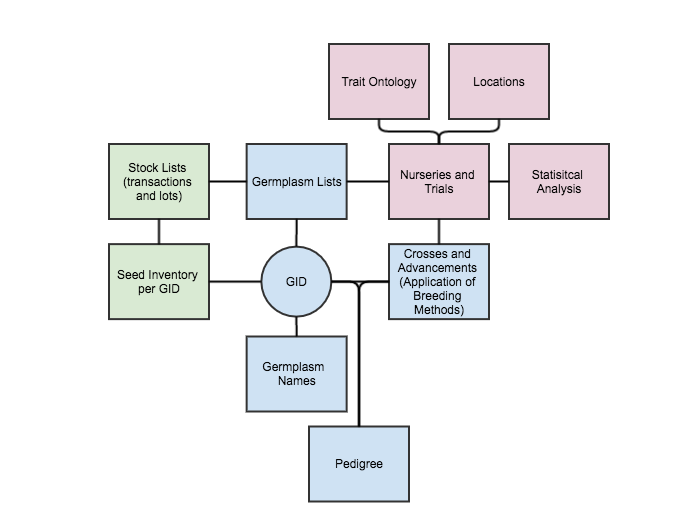 GIDs allow breeders to re-name or assign alternate names to germplasm without changing the database identifier and disrupting the continuity of data relationships. GIDs can refer to an individual with a single genotype or a genetic population with multiple genotypes. Single planting unit: seed, plant, tuber, cutting, ect. A core function of a crop database is the management of germplasm tracking and genealogy updates. BMS genealogy management system is based on the International Crop information System (ICIS) (see DeLacy et al. 2009). The open access ICIS genealogy model allows for unambiguous recording of breeding processes in a relational database. Breeding methods describe the modification of germplasm over cycles of crossing, selection, or propagation. Different crops will have different relevant breeding methods, depending on propagation biology - self-pollinated, open-pollinated, or clonally propagated. Breeding, as described by database breeding methods, creates genetic change and necessitates the assignment of new GIDs to the newly created germplasm. Generative methods increase allelic diversity by combining alleles from different progenitors (generally involve multiple GIDs), such as crossing, mutagenesis, and transformation. Derivative methods applied to a source progenitor or population (single GID), decrease or redistribute allelic diversity, such as through inbreeding and self-pollination. Maintenance methods applied to a source progenitor or population (single GID) maintain a specific level of genetic variation with the goal of creating new instances of germplasm as similar to the progenitor as possible, such as a seed increase. Pedigrees in the BMS database are chains of GIDs linked by breeding methods. This database definition of pedigree allows flexibility for missing data and revision. A breeder can revise a breeding method or GID without needing to update naming conventions, pedigree text string, or other genealogical dependencies.